There are 16 new EV charging stations at the Commuter Hub (PG) and two more at Carrier Drive. These are ChargePoint EV stations. In order to use them, you need to download the ChargePoint app. The app will ask for your credit card information. Contact Transportation and Parking Services before charging. EV drivers wishing to use the charging stations at North campus should contact James Irvine (Manager Transportation and Parking Services) in order to obtain access to the parking garage. There is a four hour time limit. Please move your vehicle within the four hours to a paid spot (either permit or paid visitor parking) so that someone else can charge their vehicle's battery. Charging stations will be complimentary until the end of February 2019 to allow EV drivers to try the charging stations. Starting March 1, 2019, the first 4 hours of charging will be free and drivers will be billed $5.00/ hour (prorated to the minute) for any additional charging. You must pay the hourly rate, or have your Humber parking permit showing to park in the spot. EV charging is available Monday- Friday 7 a.m. to 10 p.m. and Saturday- Sunday 8 a.m. to 6 p.m. (when the parking area is open). You do not need to reserve the spaces, just head to the Welcome Centre underground parking, park in an available spot and plug in. There is a four hour time limit. Please respect this and move your vehicle within the four hours to a paid spot (either permit or paid visitor parking) so that someone else can charge their vehicle's battery. These two spots are open to all Humber students, staff, faculty, and the community. Spread the word! Practice safe charging. Properly manage the cord during and after charging. Avoid over-stretching the cord, and do not place it such that it comes in contact with another vehicle. Parking for EVs only. Internal combustion and hybrid vehicles are prohibited from parking in EV charging spots. If such a situation occurs, individuals should contact Transportation and Parking Services and non-approved vehicles will be ticketed and/or towed away. Don't charge if you don't need a charge. Utilize your home as your primary charging location and use workplace charging (as needed) to augment your home charge. Recognize that workplace charging is a privilege. Charging an EV at Humber is available on a first-come-first served basis. Humber does not guarantee that a charging station will be available for drivers' use. 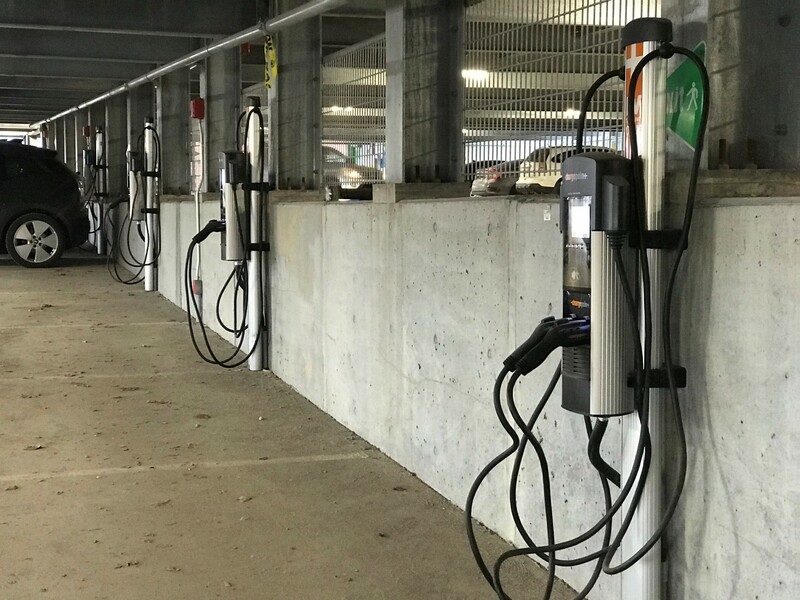 Humber College is opened 16 new EV chargers in 2019 at North Campus. However, the demand for EV chargers on our campuses will likely exceed the availability of charging stations. At Humber, all the EV chargers are Level 2 charging stations - they provide up to an 80 per cent charge after four hours. As a result, Humber will encourage drivers to share charging stations by moving their EVs to a regular, parking spot after four hours of free charging. Charging stations will be complimentary at North Campus until the end of February 2019 to allow EV drivers to try the charging stations. Starting March 1, 2019, the first 4 hours of charging will be free and drivers will be billed $5.00/ hour (prorated to the minute) for any additional charging at North Campus. All individuals using the EV chargers require a parking pass (permit or day pass). How do drivers start charging? Tap to charge. With the ChargePoint app installed, drivers can start a charging session by holding a phone over the reader symbol on the station. Individuals must have the iPhone or Android app and be signed into their account. Start charging from the app. Choose the station and click the "Start Charge" button. Use a ChargePoint card. Individuals can tap their activated ChargePoint card on the card reader symbol on the station. My parking permit is currently for a Lot that is not the Commuter Hub. How can I use the EV stations in the parking garage at North to charge a vehicle? If you are a parking permit holder and need to charge your EV at North campus, you need to contact James Irvine (Manager Transportation and Parking Services) to have your access card updated to allow you to enter the parking garage. After four hours of free charging, you will be billed $5.00/ hour (prorated to the minute). We encourage individuals to move their car back to their assigned lot within four hours to avoid the above charge. Can individuals using the visitor parking use the EV charging stations at North campus? If you use the visitor parking lots and pay a daily parking fee, you need to pay the daily use fee at the entrance of the parking garage. After 4 hours of free charging, you will be billed $5.00/ hour (prorated to the minute). We encourage individuals to move their car to a “regular” parking spot within 4 hours to avoid the above charge. Connect with us! Send an email to sustainability@humber.ca and share your comments, questions and concerns. As these are so new, we are getting used to managing them and working out a few kinks!